As usual, Wikipedia is useful for providing the background to this topic. Programs using pointers can be difficult to understand, so we advise you to study the Linked List section of our tutorial Lists, Stacks and Queues before attempting to master the code for binary search trees. 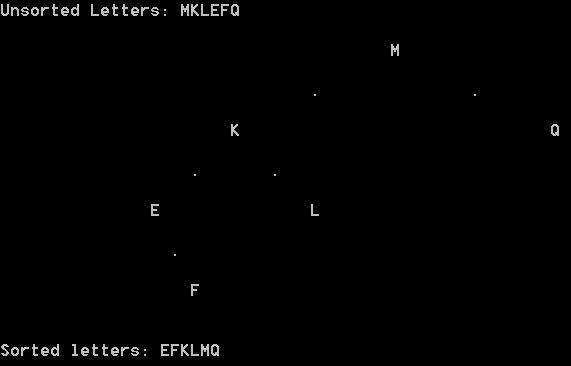 Program DrawBST shows letters being sorted as they enter the tree. Going down the tree a level at a time, each displacement in the x direction of a node from its parent is halved. This means that the order of the sorted letters is the same as the order of their x co-ordinates. A 6-letter version of program DrawBST outputted the following diagram. In both of our programs demonstrating binary search trees, we define a type NodePtr = ^TNode. This means that a variable of type NodePtr, such as RootPtr is a pointer to a record of type TNode. (The pointer is a variable that contains the address of the record). The record contains data and pointers to its left and right child nodes. These pointers are set to nil if there is not a node to point to. The instruction new(NextNode) creates a new pointer named NextNode of type NodePtr and also the new record of type TNode that it points to. Records created in this way use an area of memory called the heap. The programmer should free up this memory when the record is no longer required with a statement such as dispose(NextNode). In our programs we omit the process of deleting a node from a tree, which requires different code depending on the type of node to be deleted. It is a useful exercise to perform a dry run for the operation of procedure InOrderTraversal on a small binary search tree constructed from the letters MKLEFQ. The writeln statement cannot be executed until all the Left pointers have been followed recursively, so the first output must be the first in alphabetical order (E). (An action such as writeln at a node is termed visiting the node). After this first visit, the recursive call InOrderTraversal(Root^.Right) is executed for the same node. Since the leftmost node has a right leaf child (a child without a child of its own), then this will contain the next letter in alphabetical order (F). Try to continue this dry run for more letters. You can check your trace against the following. We produced it by adding write statements to procedure InOrderTraversal to output a commentary to a text file. Before running procedure BuildTree of program BinarySearchTree, you need a text file named 'UnsortedWords.txt' in the program folder. We suggest that you write the name of a different colour on each line of the text file. Try to follow our dry run including the recursive procedure AddToTree and then see if you can understand how the other procedures work. We will (in our minds) start a new program then select the second menu option twice to add records with Str fields 'green' and 'red' to an empty tree. At the start of a new program, procedure InitTree sets RootPtr to nil. We choose option 2 from the menu and our entry 'green' is assigned to CurrentStr. The following two lines of code are executed. Much of the dry run is of the recursive procedure AddToTree, which we reproduce below. The next instruction in our dry run is AddToTree(RootPtr, NextNode);. Root = nil, so Root := NewNode and RootPtr points to the green record, the Left and Right fields of which are set to nil. Root^.Right is green's right pointer and NewNode is a pointer to the red record. This time Root = nil, so Root := NewNode. This makes green's right pointer now point to the red record. Finally, red's left and right pointers are set to nil. A new 'red' leaf node has been created as the right child of 'green'. We conclude by tabulating the final values of the variables. Write a procedure for program BinarySearchTree to output the strings in reverse alphabetical order. Write a binary search tree program to sort and search for integers supplied by the user. Write a procedure to search for then delete a leaf node from a binary search tree. We challenge you to write code to delete the other types of node.